Four-piece sister act, Stonefield, couldn’t be hitting their stride at a better time—their dynamite synthesis of prog, metal, and psych-rock is sweeping the scene and solidifying them as heavy hitters in the genre. Their forthcoming LP, Far From Earth, out April 13, is a spirited take on questions of identity and perspective in the vastness of the universe. Despite it’s rollicking energy, the LP hits moments of tenderness, with sultry melodies and catchy choruses. Need proof? Check out the album's title track, which hit the interwebs a little over a month ago. 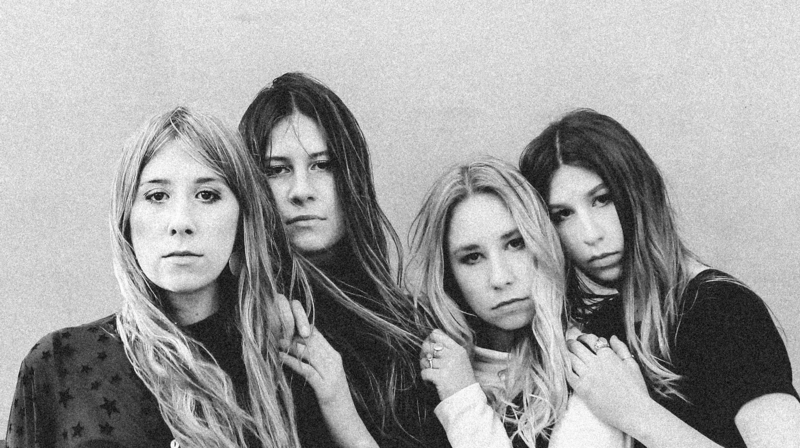 Built up with strokes of synth and impassioned guitar riffs, this treasure indicates that Stonefield have not only found their voice, but mastered it. Aside from making us want to jam TF out wherever we are, their music also has a cinematic feel to it, which is why it made total sense when we found out that they're huge movie buffs as well. When they’re not playing shows on the road, catch the girls in their tour bus binging on cult classics like The Virgin Suicides, The Lovely Bones, and Call Me By Your Name. We wanted to know what tracks stood out from the pack from their favorite soundtracks, so they gave us list of their go-to's. 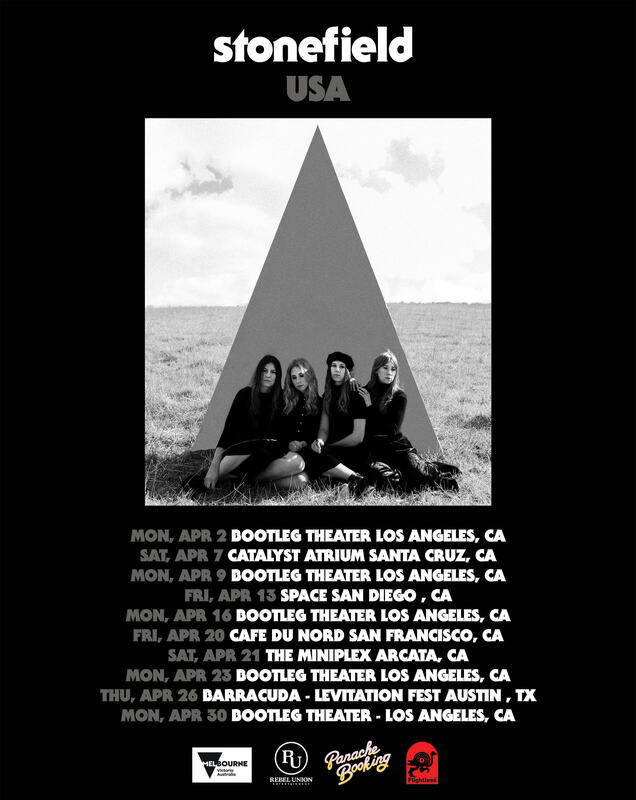 Check out their picks below, and if you live in LA be sure to catch them playing new songs off the album during their month-long residency at the Bootleg Theatre in April! "In our down time one of our favourite things to do is go to the pictures, we especially love going to see small independent films. Film soundtracks play such an important role, and there is always that song that stands out, contributing to making a scene so much more special. After seeing an amazing film we become obsessed with the soundtrack, and listen to our favourite songs from the film over and over. Here’s some of our fav songs from a few of our fav movies." "Although The Lovely Bones is a really horrible story, the film itself is actually really beautiful. This song in a way encapsulates the film... it’s sad but uplifting at the same time. On our last tour in the states, we listened to this song countless times on the drive from Portland up to Montreal. It was snowing, and all the lakes were frozen over, it was so mesmerising, and now this song just reminds me of that." "We went to see this film a few weeks ago, and we all just couldn’t stop talking about it. It’s currently my all time favourite. It’s such an alluring love story, and also an accurate representation at that, it’s very real. The majority of the music throughout the film is piano based, 'Mystery of Love' comes in to accompany a gorgeous scene towards the end of the film, and it stands out in the perfect way. I haven’t been able to stop listening to it since. It’s such a lovely song." "Sofia Coppola.. what a star. The Virgin Suicides has always been a favourite movie of ours, despite the fact that the movie surrounds a serious matter, the concept is really cool. The cinematography along with the score by Air makes this film a dreamy sentiment. Playground Love is hazy psych goodness." "20th Century Women is such a good film! I don’t know why it didn’t get more hype, I really loved the storyline, it’s quite unique, which made it really enjoyable to watch. I love this song in particular from the film’s score, the ambience of the track takes you on a relaxing cosmic journey... it’s a great one to listen to when we’re coming to the end of a long driving day on tour." "The soundtrack for this film is so good!! I discovered The Shangri-Las through this movie, this song in particular stood out because of it’s authentic 60s sound, and graceful spoken word poetry. It’s refreshing to hear a song that tells a story though its very literal lyrics but in a sophisticated way..."